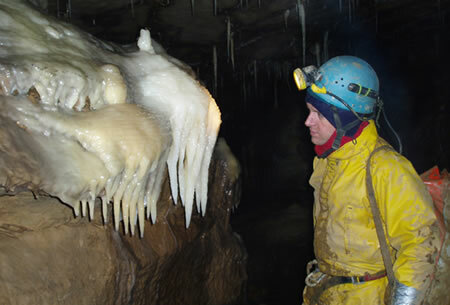 The Cave Instructor Certificate is the highest level of professional qualification available in the UK. It qualifies the holder to instruct all aspects of caving activity, at any level, and to all types of client group, without restriction. Registration for the scheme is available to experienced cavers who are comfortable rigging and leading in grade IV vertical cave systems. Candidates should have at least two years active involvement in caving in a variety of systems and preferably in different areas as a minimum prior to attending a training course. Some experience of working with novices underground is essential. They should hold the LCMLA Level 2 award (incl. SRT for the leader) and have acquired some prior experience in SRT self rescue techniques. The minimum age for attending the training course is 18 years. The Training Course is designed to provide intensive tuition in a wide range of techniques for working with instructed groups in horizontal and vertical cave systems. However, it cannot provide comprehensive training in all syllabus areas and candidates will need to gain further appropriate experience prior to assessment. Some club cavers may wish to take part in the training to improve their skills in passing on techniques in the informal club-training environment. There is no obligation to proceed to assessment. Following training, and prior to assessment, candidates are required to undertake a six month (minimum) 'consolidation period' when further training and relevant experience can be gained. At assessment candidates will need to demonstrate a wide and varied practical caving experience and knowledge gained over at least 4 years, and including most of the major underground systems in their main caving area, as well as the smaller systems used for initial caving experience. They should also have visited at least 10 classic systems in a minimum of two other areas. Candidates will need to be familiar with all types of underground terrain including tight passages, traverses, boulder chokes, streamways, deep water, free-diveable sumps, climbs and pitches, and abandoned mines. 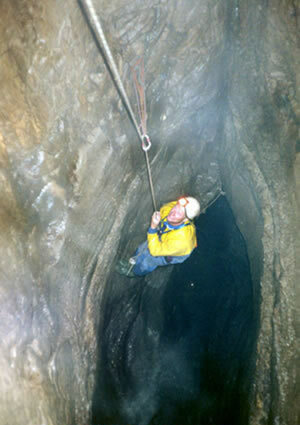 Experience will be both at a personal level and in leading novices or less experienced cavers. The candidate must hold the LCMLA Level 2 Award (incl. SRT for the leader) and have gained a minimum of 20 days leadership experience, working in both horizontal and vertical systems. Assessment comprises of three separate practical modules, taken over five days. Once Module 1 has been completed each of the remaining two modules need to be undertaken within one month of completing the previous one. An additional 1-day assessment, Module 4, is available as an option for those who wish to gain the CIC Mines Module. Full details of the Scheme, including syllabus, handbook and registration requirements, are available from the BCA.